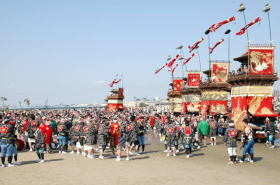 and was designated as Japan's Important Intangible Folk Cultural Asset in March 2006. 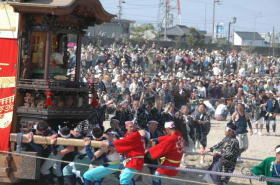 SHIOHIMATSURI is a festival of Kamisaki shrine. the god of the shrine, landed on this area from the ocean a long time ago. from late 17th century to early 18 century in various documents. 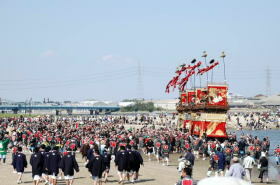 The tradition of the festival has been passed on over 300 years. 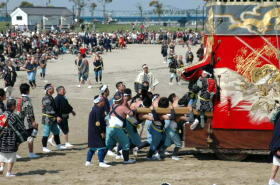 The parade floats were reconstructed and repaired many times since the first construction. embroidered in gold thread and 4 cloisonne pillars. In addition, elaborate puppets dance gracefully on each parade float. bringing together consummate arts and crafts at the end of Edo (Shogun) period. prevented the parade floats from getting into the beach. 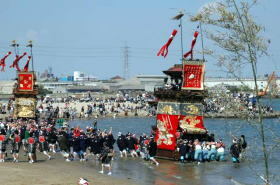 the great festival with drawing down to the beach was resumed. 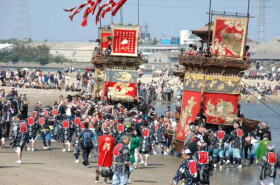 by a firm Group system for the festival and become more popular year by year. 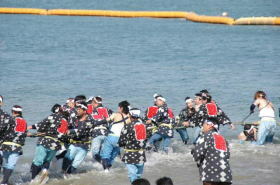 It's also maintained as a traditionally all-male festival. 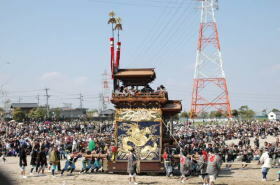 the moves toward reevaluation od cultural value of the festival occurred in the town. The restoration of unusable puppets with damage or loss was made in succession. Today all parade floats have 2 puppets in both front ledge and upper part. Furthermore, the restoration of splendid curtains, sculputures and other decorations has been made. to prosterity has grown year by year. 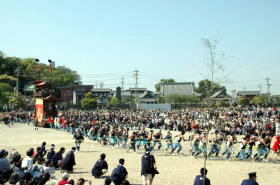 as a nation's sibnificant intangible folk cultural assets. Get off at Kamezaki station.